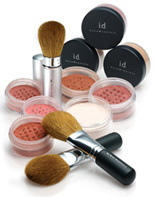 Bare Minerals is the original mineral makeup of the entire mineral category. It was founded in 1976 with a first product, the one we all now know as 'Warmth'. Micronized minerals with nothing added, no preservatives, oil, fragrance or other chemicals that cause skin problems. So pure.. You can even sleep in it!